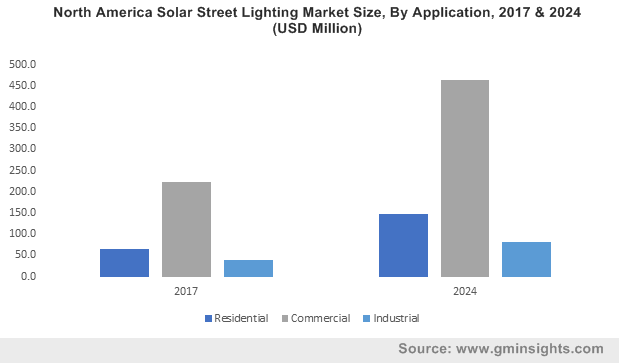 Solar Street Lighting Market size was valued at USD 2.9 billion in 2017 and annual installation is anticipated to exceed 9 million units by 2024. Global solar street lighting market size will witness strong growth on account of global commitment towards climate change mitigation along with aggressive government reforms toward sustainable development. Increasing public and private funding through numerous investments, schemes coupled with introduction of long term government programs to electrify off-grid areas will positively influence the business outlook. For instance, in 2017, ENGIE in partnership with Electric Vine Industries announced an investment of over USD 200 million for the deployment of solar microgrids across Indonesia. Rising demand for sustainable energy along with growing potential of solar technologies will foster the market growth. Declining component cost on account of financial leveraging, growing manufacturing facilities and improving economies of scale will stimulate the industry growth. Further, the technological advancement in product design and declining battery costs have significantly reduced the off-grid solar lighting component prices, making them a desirable alternative for municipalities and households. Standalone solar street lighting market will witness a significant growth on account of growing product adoption across off grid or remote areas. High costs associated with street light infrastructure across remote areas makes these products an attractive alternative. Rising adoption of pico-solar systems subject to favorable regulatory reforms toward expansion of isolated solar networks will further boost the product penetration. Grid connected market is anticipated to witness gains over 7% by 2024. Introduction of government programs including feed in tariff (FIT) and net metering will further boost the product penetration. In addition, the expansion of micro-grid networks for large-scale renewable integration will positively impact the business growth. LED solar street lighting market is estimated to grow owing to efficient lumen and wattage characteristics when compared to its available counterparts. The government initiatives toward renewable energy adoption coupled with focus towards resource optimization will further complement the product demand. Global efforts to limit the use of toxic heavy metals including Mercury may hamper the CFL demand. Declining costs of energy efficient products along with government funded mass procurement programs may further restraint the business growth. Residential solar street lighting market is set to exceed 1.5 million units by 2024. Increasing residential societies along with low-maintenance cost of these systems will foster the business growth. Rapid urbanization along with government-assisted lighting programs will further drive the business landscape. Industrial solar street lighting market is anticipated to witness a significant growth owing to increase in on-site electricity generation coupled with advanced smart control networking initiatives. Rising need for energy optimization and drive towards sustainable manufacturing are some of the paramount factors which will enhance the product penetration. Furthermore, incentivization, feed-in tariffs, net metering, and similar favourable reforms will further compliment the industry growth. U.S. market is anticipated to grow over 11% by 2024. Growing demand for optimized energy management coupled with rising solar energy installations will boost the industry growth. According to the U.S. Department of Energy, solar jobs have escalated by 123% in North America, since November 2010. China market was valued over USD 400 million in 2017. Appreciable growth in distributed solar projects along with government initiatives to promote sustainable energy resources will give positive thrust to the market growth in the country. Expansion of manufacturing facilities and declining product costs will further complement the business growth. 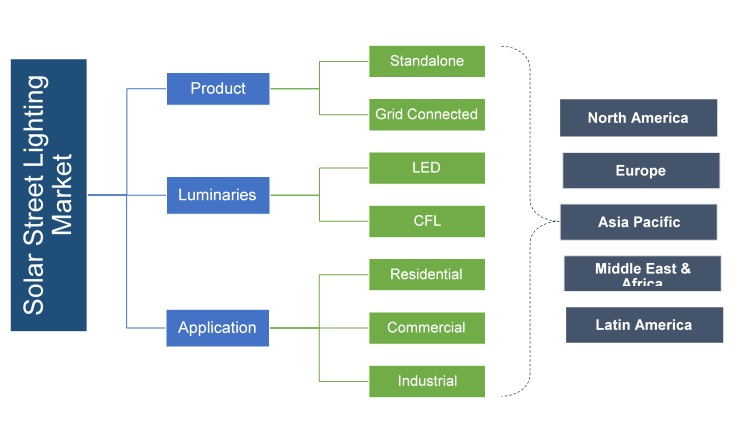 Germany street lighting market is set to witness strong growth owing to integration of extensive distribution networks, regional expansion, development of new applications, and sale of powerful systems with higher cost margins. Significant progress towards renewable integration across the country will further boost the product penetration. Eminent industry players catering across the global market includes Anhui Longvolt, Bisol, Greenshine New Energy, Solar Lighting International, Solar G, Orion, Covimed, Leadsun, Jinhua SunMaster, SEPCO, Shenzhen Spark Optoelectronics, Zhuhai Bomin, Solux, Urja Global, Sol, Solar Street Lights USA, Exide Industries, Su-Kam, Sunna Design, Philips Lighting, SOKOYO, Dragons Breath, Bridgelux, and Omega. Introduction of new products, innovative renewable energy business financing schemes and improvements in distribution channels are some of the key strategic initiatives under taken by the prominent industry participants. The companies are also focusing toward product enhancement and expanding geographical presence to maintain competitive edge. Solar street lights are elevated light sources powered by photovoltaic panels mounted at a height. PV panels are installed on off grid locations and find wide application in residential, commercial, & industrial purposes. The electricity generated gets stored into batteries that is used to illuminate pathway later. Government schemes & initiatives for deployment of off grid electricity is forecasted to be a key factor propelling the industry.